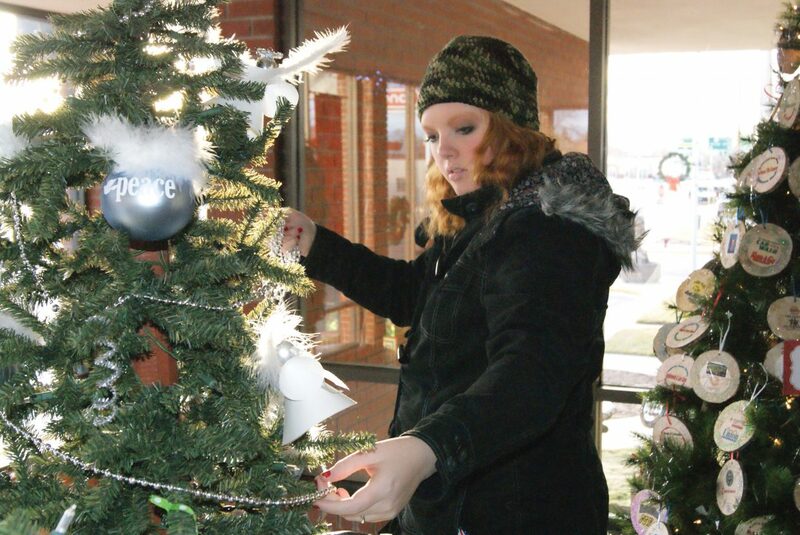 Laurie Cotten, a junior at Moffat County High School and part of the Moffat County Youth United Way and Key Club, decorates the groups' combined Christmas Tree at the Moffat County Courthouse Tuesday afternoon for the Festival of Trees. The trees will be on display beginning Thursday until December 26. There will be special community events from 5 -7 p.m. every Thursday throughout the month of December. The spirit of Christmas has invaded the Moffat County Courthouse. Anyone who steps inside will hear Christmas music playing between the 23 Christmas trees that fill the halls. The first Festival of Trees, a program put on by the Moffat County Youth United Way and Key Club, features themed trees from local non-profit organizations. “I think it’s just fun to have music and decorations up, and to see all the people coming and going,” said Stephanie Beckett, deputy clerk to the board of county commissioners. In full swing Tuesday, non-profit groups worked to put up their trees in time for judging today. One local non-profit group will be awarded $500 to go toward one of their programs. Corrie Ponikvar, Executive Director of the Moffat County United Way, said trees will be judged on normal Christmas tree expectations, such as being neat and well put together, lighting, any kind of display below such as a tree skirt, and adequate reflection of the sponsoring non-profit. There’s no doubt the choice will be tough, with contestants getting creative. A tooth fairy adorns the top of the Northwest Colorado Dental Coalition’s tree. A book sits atop the Moffat County Libraries tree and the City of Craig parks and Recreation sports-themed tree has tiny Santa Clauses made from tennis balls. And those are just a few of the trees. Matt Beckett was at the courthouse setting up the Craig Youth Hockey Christmas tree. With a hockey helmet as the topper and pucks decorated by the squirt and peewee teams, Beckett’s tree was as cute as they come. Some non-profits have made extra ornaments to be available for purchase. Connections 4 Kids tree is covered in children’s artwork from the Cherish the Little Things children’s art show. The artwork, mounted on miniature easels double as ornaments and desktop art. They will be for sale for $5 at the Moffat County Clerk and Recorder’s office. All proceeds go to Moffat County Youth United Way and Key Club. Ponikvar said the idea evolved out of what was initially a fundraising idea. She said they originally had thought about creating the trees for businesses to buy, then she said they got to thinking the trees would be taken home and not available for the community to see. The trees will be on display from 8 a.m. – 5 p.m. Thursday through December 26. Every Thursday beginning the 6, the display will remain open from 5 p.m. – 7 p.m. for two additional hours and feature activities for the community. Those activities include a tree lighting ceremony with Mrs. Claus and her elves, live holiday music, story time, and refreshments. Ponikvar said the activities on Dec. 20 will be sponsored by the Craig Chamber of Commerce and will include community Christmas caroling. The event was free for non-profits and if a business wanted to put one up, it cost $25 to register. The fee would be considered a donation to the Youth United Way. Ponikvar’s husband, John, paid to put in a Charlie Brown Christmas Tree, complete with Snoopy at the bottom. Ponikvar said Lennie Gillam and his crew had been wonderful to work with in getting the trees set up.